It’s everything-pumpkin season again. 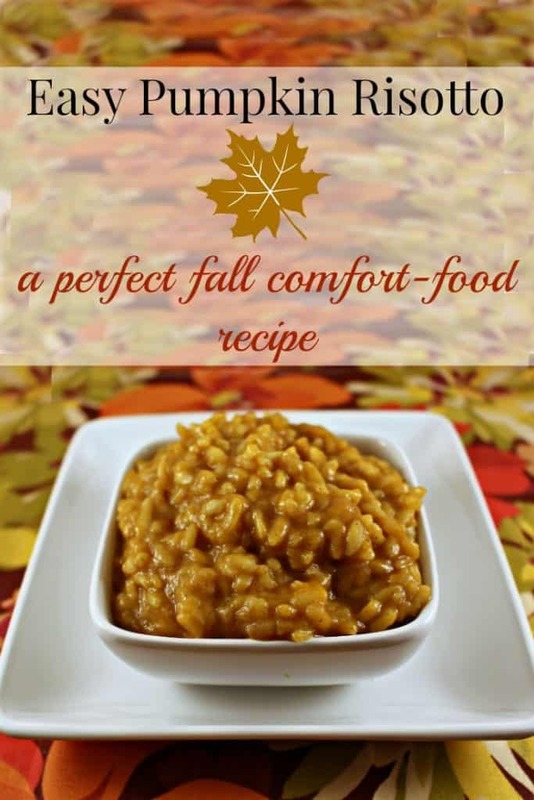 I’m sharing my easy pumpkin risotto recipe with you today. You can add it to your fall recipe list along with the amazing pumpkin chocolate chip muffins I shared recently. Don’t forget to check out my other yummy fall dishes like creamy potato soup, easy slow cooker roast, pork chops with fried apples, quinoa-stuffed roasted acorn squash and butternut squash soup. They will all be appearing on my meal planner over the coming weeks. The rumors are lies! Risotto has a bad rap and I’m here to rescue it from these terrible falsehoods. Repeat after me: Risotto is not scary. Risotto is easy to make. Risotto doesn’t take talent to prepare. Now, try my recipe for delicious, creamy pumpkin risotto. This recipe starts with the basic risotto recipe and can be eaten without pumpkin added to it. Or, you can add butternut squash, mix in pepperoni, top it with mushrooms or any number of other add-ins. Our favorite just happens to be pumpkin. 2. Saute onions until they are translucent and add garlic to saute for a few minutes. 3. Pour rice into the pot and toast it in the butter, onions, and garlic until it becomes translucent. 4. Add one cup of chicken stock and stir. 5. Continue to stir off and on until the liquid is absorbed. 6. Repeat steps 4 and 5 until the full three cups of stock is used and mostly absorbed. 7. Remove from heat and stir in the pumpkin and salt. –This recipe was based on using homemade chicken stock, with no salt added to the stock. If you’re using store-bought, boxed or canned chicken stock, you probably won’t need to add extra salt. –Once, on an episode of The Next Food Network Star, a rude Wolfgang Puck became disgusted by the lack of movement in the risotto made by one of the contestants. He abruptly took her to the kitchen and showed her the right way to make risotto, mortifying the contestant, the other judges and much of the at-home audience. It was a lesson we never forgot, though! Risotto should flow and not stand stiffly on your plate. Apparently. And fussy Austrian-born French chefs should chillax. Definitely. –Try topping this pumpkin risotto with goat cheese, toasted pecan pieces or dried sage for extra decadence.